Had a great Sew Club session on Friday. I "taught" the group how to make a clutch from a pattern my mom and I worked on several years ago. I love how you can take one pattern and come up with so many different styles. Ang did a beautiful gold and black clutch from some sample fabric she had. It turned out beautiful. 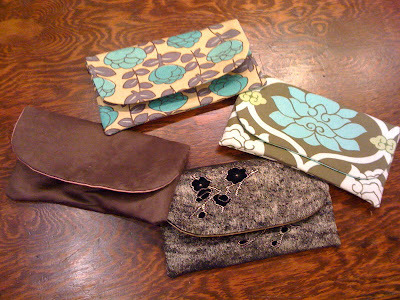 Rocky made a crisp looking little clutch out of a new Japanese fabric from Cool Cottons. It was her first clutch and turned out beautifully! I did some slight tweaks to my clutch from an old Amy Butler fabric and then tried doing a suede clutch with silk lining. Better luck next time on the suede. What was I thinking? It is a little awkward. I am going to write up some directions and post it online soon for this easy, and absolutely adorable, date-worthy clutch. They came out so cute! And it was such a fun meeting! :) Thanks for teaching!